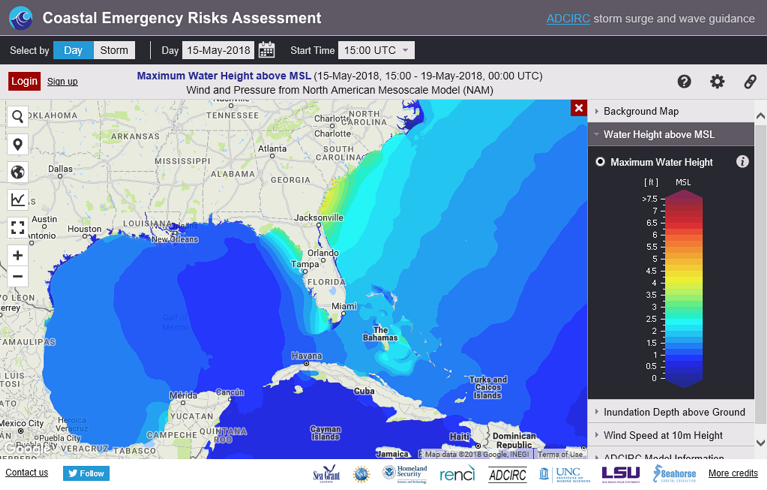 The Coastal Emergency Risks Assessment (CERA) web mapper is a visualization tool to deliver storm surge and wave guidance for impending or active tropical cyclones in the United States. Emergency managers, weather forecasters, and GIS specialists can retrieve real-time results from the ADCIRC storm surge model to evaluate the impacts of a tropical event or to see the tide, wind-wave, and surge conditions on a daily basis. The CERA maps are produces, solely, to provide guidance to local, state, and federal emergency managers and designated emergency responders. By accessing the CERA maps and using the associated GIS data, you agree to the CERA Terms & Conditions.